A wonderful friend recently gave me the hand made ceramic cup pictured above. Sometimes I keep it on my kitchen counter or the desk where I work on my computer. And then sometimes I put it on my bedroom chest of drawers. I like to move it around the house because there is something comforting about it’s handmade texture and it brings to mind the simple yet special things about life. Things that ease my frantic feelings when I am stressed. Such as receiving an unexpected telephone call from someone I haven’t heard from in a long time or hearing the ping on my cell phone as a new picture, video and text is received. It’s amazing how those small considerate thoughts from family and friends help to make me feel included and emotionally connected. But then there are those days when it feels as though nothing went the way I thought it would. You know those days right? You have car troubles or you and a family member argue. Someone at work does you wrong or your spouse or your children are ill. Yuck. Yuck. And double yuck! That’s when I, and perhaps you too, feel the need for a huge Cup of Healing. Something to help you mend your tattered feelings. A cup of healing in this instance can be the tried and true ways you may found for putting the brakes on unpleasant thoughts and feelings and then choosing to shift to something positive. For me, I try to heal myself through meditation or going for a walk or a run while repeating positive affirmations to myself. Letting go of the negative is not always as easy as I would like (you’d be surprised to hear some of my more creative affirmations!) but nevertheless quiet places do offer me the space I need to take deep breaths, gather myself back together, and begin again. Exercising that shift to positive is when I find myself searching for good ole mother comforts to restore my inner spirits back to a place where I feel protected again from the big bad dysfunctional juju of the outside world. Difficulties, challenges and anxieties are unfortunately a part of all of our lives. Yet I find that what really works for me is to try and name the problem and then let go of those emotions as quickly as I can. For my cup of healing reminds me that it’s the simple things in life, not the every day frustrations, that I need to pay attention to. 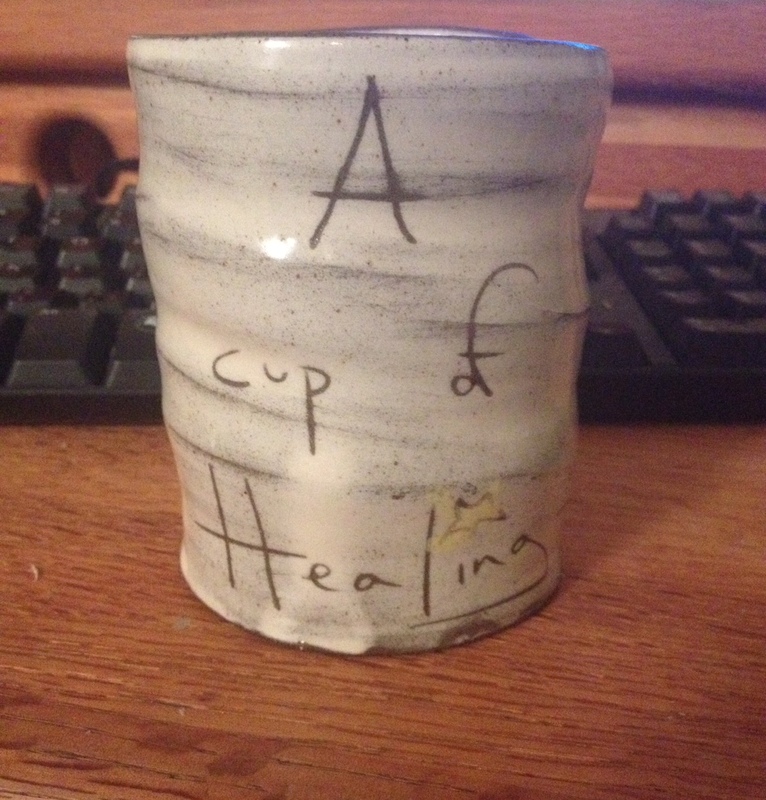 A cup of healing can be a kind word or a gesture or a decision to move from doubt to a feeling of hope. While I strive every day to find a blessed balance in my life, my cup of healing goes a long way to bringing me calm intentions. I’ve had a two and a half week cup of healing. One whole week with my sweet Brenn at my house before she went back to school in Charlotte. Five days with our friend Mary Pat at the New Jersey shore. And five days with my sister, Anne, and her hilarious daughter, Kelly, in Maryland. I am sitting here alone, contemplating these times. I think my cup is full. It was not a quiet time, but my cup is full. Hi Debbie: So good to hear from you and I am so happy for you! A full cup is a glorious thing! ENJOY! !